Have you ever wondered why some people are constantly plagued by sickness, while others are able to avoid falling ill completely? 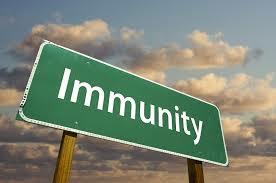 The answer lies in how powerful our immune system is and its effectiveness in protecting us against disease. A strong immune system can increase our chances of avoiding illness, and it can also play a vital role in aiding our recovery when infection hits. A strong immune system relies heavily on a healthy diet. In fact, more than half of our immune system lies within our digestive tract. The body breaks down and absorbs nutrients from the foods we eat to protect us against illness. The nutrients found in fresh fruit and vegetables play a crucial role in strengthening and supporting our immune system. Other immunity boosting foods include eggs, yoghurt, red bell pepper, ginger, garlic and mushrooms. Hand washing is one of the best ways to prevent the spread of infections but while we are all familiar with the importance of washing our hands regularly, research reveals that only 5% of people wash their hands correctly. Regular exercise is a pillar for good health and it can strengthen our immune system. Exercise provides a boost to the cells in our body that are assigned to attack bacteria, helping our immune system to become better equipped to handle bacteria that can lead to illness. When sleep suffers, so does our immune system. A lack of sleep causes changes to the system that regulates our immune defense, making us more susceptible to illness and infection. Experts recommend a minimum of seven hours of sleep per day for optimal benefit. Today’s busy lifestyle can make it difficult to maintain a healthy diet and routine, and our immune system can suffer as a consequence. Taking a natural immune boosting supplement daily can provide our body with the added nutrients it needs to keep fighting fit. Immulina® is available from Vital Life International, please contact Mark or Amin on 0207 720 1441 or email info@vital-life.org.uk.